Tunisian crochet is a little-known type of needle craft that is growing rapidly in popularity. Often described as a blend of knitting and crochet, this unique craft is versatile enough for a fun variety of crafts. Like most needle crafts, the exact details of how Tunisian crochet came to be are lost to time. This traditional craft appears to have developed in Central Asia and spread rapidly to Russia, Scandinavia and Eastern Europe. Because of this widespread use, it is also sometimes called German and Russian work. It was popular among the working class, giving it the nicknames of shepherd’s knitting and railway knitting. Even Queen Victoria was said to have been a master of this style, giving it the name Royal Princess knitting. When watching someone do Tunisian crochet, the most obvious difference from other crafts may be the hook. Although the Tunisian or Afghan hook is similar to other crochet hooks, you’ll want to use one that is at least two sizes larger than you normally would for that project. 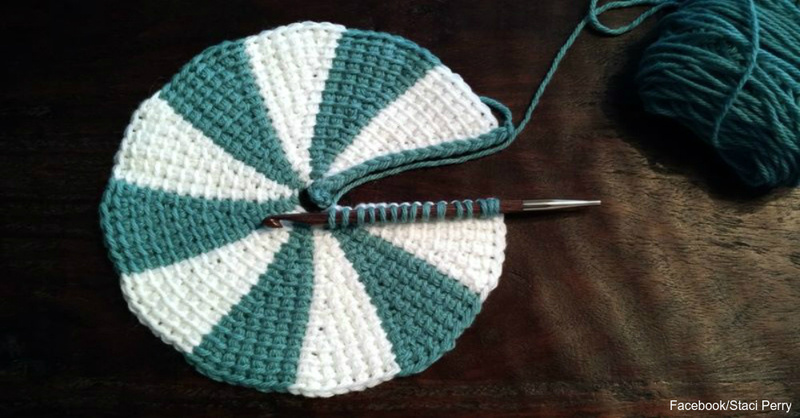 Some people prefer to use a flex hook, which is a large crochet hook with a flexible cord attached to help hold additional stitches. Another major difference of the Tunisian style is that you don’t turn your work. Instead, you alternate forward and return rows with the front of the project always facing you. Tunisian crochet does have many distinct stitches, including a simple stitch, knit stitch and purl stitch. Many of these only have slight variations from their more popular counterparts, making Tunisian crochet easy for any experienced crocheter to learn. Tunisian crochet is a versatile art that produces many different looks. Most projects are done in heavier yarns to produce warm, dense garments with lovely accents. It’s great for afghans, shawls and more. One trend that is growing in popularity is the use of lighter yarns for a more lacy, delicate look. This produces some cute fashion items, including tops and scarves.Tunisian crochet is a fun way to expand your skills and create more diverse projects. If you enjoy learning it, try tapestry crochet, too.